This study shows promise that papaya leaf tea may be a protective and healing agent for diseases of the liver. (6) Afzan A, Abdullah NR, Halim SZ, et al. Repeated Dose 28-Days Oral Toxicity Study of Carica papaya L. Leaf Extract in Sprague Dawley Rats. Molecules. 2012;17(4):4326-4342. 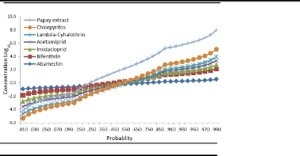 (8) Antonella DA, D’Arcangelob G, Tagliatestab P. Gas chromatography–mass spectrometry analysis of phenolic compounds from Carica papaya L. Journal of Food Composition and Analysis. 2007;20:584-590. This study from 2008 establishes the anti-inflammatory activity of Carica papaya leaves. Anti-inflammatory activities of ethanolic extract of Carica papaya leaves. Authors: Owoyele BV, et al. 2008 Aug;16(4):168-73. doi: 10.1007 s10787-008-7008-0. A Study this year indicates papaya seed may be more powerful against specific aphids than chemical pesticides. Ready to enter the second stage of renovation on the third oldest building in Dawsonville, GA, the Director of the Julia Ruffin Project, Jill Nicole Gallo and her GC, David Lazenby, are beaming about how beautiful the new home for the Project will be. The Julia Ruffin Project is a not for profit organization that promotes, researches, and grows papaya leaf tea. The new home for the Project in downtown Dawsonville will provide 2000 sft of relaxed space for Nicole Gallo and her team to manage operations of the project all over the world. 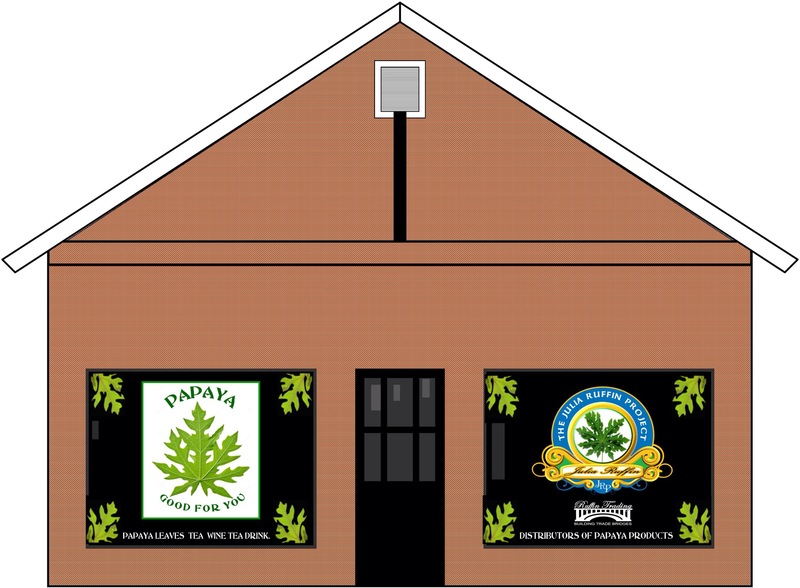 In this unique space customers will be able to drink papaya leaf tea for free. A Grand Opening is anticipated in early December. Currently agricultural and product research is focused in Jamaica. Papaya leaf “tea” continues to be studied in various forms around the world for its ability to enhance immunity. Study in the lab in Nigeria, 2009, shows again the immunological effect of papaya leaf without adverse effects on the animal body. weight of normal albino rats were investigated. Albino rats weighing between 74 g and 90.5 g, of both sexes were used for the study. 2 ml of 0.11 g/ml aqueous extract was administered daily to each of the experimented rats for the 7 and 14 days study periods respectively, using stomach canula and the parameters analysed using standard methods. Observations indicated that extract of C. papaya (Pawpaw) leaves did not induce any significant changes in the levels of AST and ALT. The results also showed that the C. papaya leaves extract influenced the immunological pathways. There was an increase in the levels of white blood cells, thrombocytes, lymphocytes and neutrophils of the test rats, and a significant weight gain in the animals at the end of the study period. Based on the findings in this work, the C. papaya leaves extract tested could hardly advance any adverse effects on the liver and also have immunological effect on the animal body. Impact of complementary oral enzyme application on the postoperative treatment results of breast cancer patients–results of an epidemiological multicentre retrolective cohort study. Cancer Chemother Pharmacol. 2001 Jul;47 Suppl:S45-54. PURPOSE: [corrected] To evaluate the impact of postoperative treatment with an oral enzyme (OE) preparation given complementary to an antineoplastic therapy in patients with breast cancer. METHODS: The design of this epidemiological study was a retrolective cohort analysis with parallel groups. Design and conduct of the study were performed to current standards for prospective, controlled clinical trials. A cohort of 2,339 breast cancer patients undergoing surgical intervention and radio-, chemo- or hormonal therapy were studied in 216 centres. Of the 2,339 patients, 1,283 received complementary treatment with OE and 1,056 did not receive OE. Patients with other complementary medications were excluded and the final analysis was performed with the data from 649 patients, of whom 239 (37%) were additionally treated with OE (test group) and 410 (63%) without OE (control group). The median follow-up time for the test group was 485 days and for the control group 213 days. The primary endpoint of the study was to determine whether complementary treatment with OE can reduce typical disease- or therapy-associated signs and symptoms (gastrointestinal symptoms, mental symptoms, dyspnoea, headache, tumour pain, cachexia, skin disorders, infections, and side effects associated with the antineoplastic therapy) in patients with breast cancer. Imbalances for causal effects (covariates) were adjusted for by means of the propensity score. Outcome analysis was performed by estimating the linear regression between change in symptom score and propensity score with all data and using this regression line to calculate the change in symptom score which would be expected for each patient. Tumour-associated events (recurrence, metastasis, and death) were evaluated in terms of the number of events observed and time to event. The safety of treatment with OE was analysed in terms of the number and severity of adverse events, their duration, treatment and outcome. RESULTS: For all symptoms except tumour pain, the adjusted mean improvement in symptom scores was larger in the test group than in the control group. The adjusted difference was statistically significant for all symptoms, except tumour pain and infections. The results show that the typical disease- and therapy-associated signs and symptoms in patients on complementary therapy with OE during postoperative treatment were significantly less. For 75% of the test group and 55% of the control group the physician recorded “no signs and symptoms”. A clear reduction in the side effects of radiotherapy and chemotherapy was documented in 74% of the test group and 55% of the control group. Analysis of survival, recurrence, and metastasis demonstrated a reduced number of events in the test group. There was evidence of a beneficial influence of OE on time to event, although the median observation time was too short in these breast cancer patients to draw definite conclusions. The safety component was judged in 98% of the test group and 76% of the control group as “very good” or “good”. In the total sample of 2,339 patients, the rate of OE-associated adverse reactions was 3.2%. All side effects were mild to moderate gastrointestinal symptoms. Conclusion: Complementary treatment of breast cancer patients with OE improves the quality of life by reducing signs and symptoms of the disease and the side effects of adjuvant antineoplastic therapies. This epidemiological retrolective cohort analysis provides evidence that the patients may also gain benefit by a prolongation of the time to event for cancer recurrence, metastasis and survival. OE was generally well tolerated.